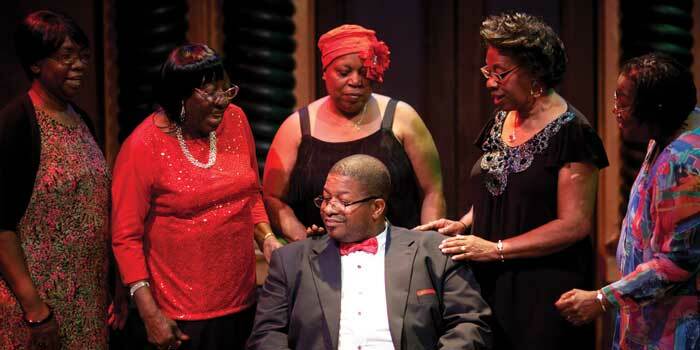 The Willis Richardson Players in Wilmington take the stage at Thalian Hall twice a year. Sometimes, they put on a rousing musical, while other shows drive home a drama’s heartfelt message. The actors snap their fingers in time to the music, nodding their heads in unison. But this rendition of Ain’t Misbehavin’ is decidedly off-key. Evelyn Noble Nixon, still dressed for her day job as a licensed practical nurse in a colorful smock and blue pants, walks toward the stage frantically waving her right hand. Anything less than their best is not enough for Nixon. Nixon wants the best for the actors and for their audiences. But she also wants the best for Willis Richardson, the man the troupe’s name honors. Born in Wilmington in 1889, Richardson was a pioneer in the black theater movement and a leading figure in the Harlem Renaissance in the 1920s. The first black playwright to have a nonmusical production — The Chip Woman’s Fortune — on Broadway, Richardson wrote and directed plays authentically depicting black life in America. Throughout the 1920s and ’30s, he wrote more than 30 plays, compiled anthologies of significant works by black playwrights, and accumulated accolades for his work. In 1928, he won the Edith Schwab Cup at Yale University for The Broken Banjo, A Folk Tragedy. Despite his early success, Richardson never earned his living in the theater. His family left Wilmington following the city’s race riots of 1898 and settled in Washington, D.C. At age 23, he went to work at the Bureau of Engraving and Printing, where he retired 43 years later. By the time he died in 1977, he was little more than a footnote in the nation’s theatrical history — except in Wilmington, where a handful of black actors formed the Willis Richardson Players in 1974 to pay homage to the playwright. Twice a year, the Willis Richardson Players remind the community of Richardson’s local roots when they take the Thalian Hall stage. In the spring, they produce a play. This month, they’ll put on their fall production, an annual show that draws performers and patrons from as far away as Shallotte and Burgaw. Richardson shared the vision of some of his contemporaries, such as W.E.B. DuBois and Langston Hughes, of using the theater as a way to encourage blacks to develop their talents and sense of integrity. His plays often center on manhood, family, and the importance of support within the black community. Today’s audiences still flock to such Willis Richardson Players productions as Raisin and Don’t Bother Me, I Can’t Cope, which fill the stage with predominantly black casts. Nearly everyone in Wilmington knows of someone who’s been in the Willis Richardson Players, especially alumni of the formerly all-black Williston High School. Before the school was converted to a middle school in the 1970s, Williston’s theater program was the crown jewel of extracurricular activities, drawing packed houses to the school auditorium every year. The plays were a big deal for Wilmington’s black community, which dressed in its finest to come out and support the students. The Willis Richardson Players, many of whom are Williston alumni, attract the same kind of support. When Thalian Hall was renovated in 2009, Bubbling Brown Sugar drew a standing-room-only crowd at the facility’s second-floor Studio Theatre, patrons squeezing along the wall for a pair of weekend shows. “I think it does a lot for the community and the younger people today, seeing these performances,” says Benjamin Foreman, a 1965 Williston graduate who, as a third grader in the 1950s, was relegated to Thalian Hall’s blacks-only balcony. Young members of the community find a place in the troupe as well. Zale Cannady, a seventh grader at Leland Middle School with professional acting and writing aspirations, gained his first community theater casting in the spring production of Ain’t Misbehavin’. His mom, big sister, and aunt also won roles in the show. “I was pretty nervous because I’d never been in a play with anyone other than my schoolmates,” Cannady says. He and his sister felt at home soon after rehearsals started. They challenged each other to get their parts right and giggled together with other cast members during breaks. As a community theater group, the Willis Richardson Players make do with a shoestring budget and an all-volunteer cast and crew. No one gets paid, yet there’s no shortage of enthusiasm for the troupe and the opportunity for fun and community it provides. Shows usually sell out, primarily through word-of-mouth advertising. Audiences show up early for Willis Richardson Players productions, and after the curtain falls at the end of a performance, they linger, sharing hugs, handshakes, and impromptu reviews. To Nixon, who has directed 12 productions, this support is the best part of the show. “I love it,” she says. But she also relishes the rehearsals and the process of getting a cast ready for opening night, regardless of the amount of work it takes. And, as a member of the players since 1996, she knows firsthand what the actors experience as they try to shape words on a page into a living work of art on the stage. She recalls the anticipation she felt on opening night 15 years ago when she played Sister Moore in Amen Corner. She channels that energy to the cast as she directs. That is, in a way that honors Willis Richardson. Herb White is the editor of The Charlotte Post.